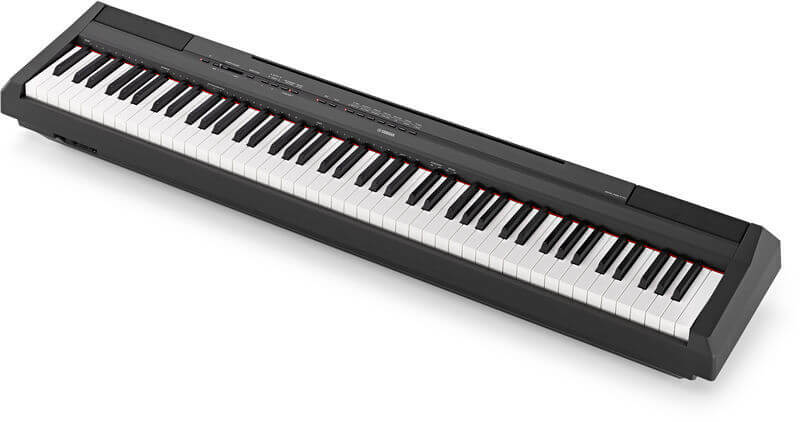 The Yamaha P45 keyboard is the successor of the Yamaha p35 version. This new keyboard offers all the features of its predecessor and is further improved with new upgrades to fit the constantly changing demands in the music industry. This keyboard is designed to deliver superior sonic performance. The keyboard is also designed in a simplistic but very sleek manner which amateur users can play without many complications and still enjoy its great aesthetic looks. The Yamaha P45 is a full-sized piano equipped with some of the latest technological equipment for an excellent performance. This technology has played a crucial role in ensuring that this keyboard takes you as close to an acoustic piano as possible. Such a piano is every music beginner’s dream. The keyboard doesn’t just give you playing skills for the sake of it. It has everything to nurture you from a learner to an outstanding music producer. The P45 has a complete package that will prepare you for the day when you finally sit on a real acoustic piano and effortlessly fulfill your music dream. You are probably still wondering why the Yamaha P45? Why choose it out of dozens of other beginner keyboards out there? These are a few of the reasons why you would be making a mistake if you overlook the YamahaP45. We actually have mentioned this piano in our best digital piano article but there’s a lot more to talk about and we will do all of it in this article. The first impression you get from the Yamaha P45 is as exceptional as the features it carries inside. The keyboard is small in size and lightweight which immediately points out to how portable it is. From touching it, you will feel just how sturdy the finishing feels. It makes the body a bit hard and resistance to surrounding elements, and hence we can feel how durable it could be if handled correctly. Generally, the designing is sleek and very attractive. To crown, it all is an optional L-85 stand which complements an already brilliant keyboard giving the entire set a finishing that will seamlessly blend with your home décor. The best part about Yamaha P45 is that it feels like an acoustic piano with all the benefits of a digital one. The lower end weighted actions are a lot heavier than the upper ends and that gives it a feel of an acoustic version. The look is also very simple as Yamaha didn’t try to be overly creative with the look of their piano. The weight and responsiveness of keys will hugely determine how fast you can master various moves. These two factors will also determine how well you can transform from a beginner’s keyboard to a real acoustic piano. This is why piano teachers will always advise you to go for a beginner keyboard that will give you an almost realistic experience when pressing the keys so that you can adapt to acoustic instruments much easier. Yamaha has taken several steps to ensure that this keyboard offers such an experience. One of the measures they have taken is to incorporate the Graded hammer Standard technology. This technology is similar to real acoustic pianos which alter the weight of the keys. At the lower end, the keys are made to feel heavy but become lighter as you come to the high ends. This will make it easier for you to adapt to acoustic pianos much faster. Additionally, the Yamaha P45 is programmed with four sensitivity levels, i.e., Fixed, hard, medium and soft. You can, therefore, share the keyboard with young people by just changing this sensitivity option. Adults with weak hands can also take full advantage of the medium and soft sensitivity levels to play the keyboard comfortably. The Yamaha P45 is an affordable keyboard, but it hasn’t done anything to compromise on the quality of sound produced. First of all, this keyboard comes with a 64-note polyphony which is an improvement from the P35 model. 64-notes may not sound enough, but within the price range of Yamaha P45, this is quite reasonable. In fact, it has much more than many other keyboards retailing at the same price. With the 64-notes you can effectively play any chord while using the sustain pedal. The advanced wave memory stereo sampling is another incredible feature on this keyboard. It is responsible for the production of realistic sound in the stereos which improves the overall quality of your music productions. One of my favorite features on this keyboard is its two reverb options (Hall 1 and Hall 2). What’s the purpose of these features? Reverb is a spec that is used to improve the reflective qualities of sound in the room. This allows the sound produced from the keyboard to feel like they are being reflected from the walls and it does more than that; it enriches the sound making it fuller and more natural which directly makes listening to your music more pleasing. These two features bring the reflective abilities of the sounds produced at your fingertips. They both offer unique reverberations, and they are also adjustable for you to tune them to a finer degree. Dual mode is another cool feature to have in a digital piano. What it does is that it allows you to play with another voice or an instrument by combining two items in one piano. One of the reasons why the P35 model was becoming obsolete is due to its connectivity shortcomings. The Yamaha p45 did not come with a USB port connectivity option which in this age is quite a big drawback. This problem is now solved with the inbuilt USB port. From this port, you can connect the keyboard to an iPad or computer where you can customize and improve the keyboard’s functionality. You will also need this port to connect the piano to a device that will allow you to record and save music’s produced since there isn’t a built-in recording option. The keyboard doesn’t have a MIDI port, but Yamaha recommends that you use a MIDI USB device to overcome this problem. There are enough USB ports and options for you to make sure that you do not have to worry about mixing things up by adding additional instruments, pc or something else to the piano. The single button operation is super simple to manage but the touch is sensitive enough to make sure that you do not have to put a lot of effort into this. Yamaha has come to a step closer to making the perfect beginner’s piano with the Yamaha P45 model. This instrument has inherited and improved all the best features from its predecessors and gone a step further to include all the missing pieces needed. It’s for this reason why the 88-key GHS piano is an excellent choice for both aspiring and developing musicians that want to practice on a keyboard that offers the unreal experience of the traditional acoustic piano.